Regular readers will be familiar with my concept of the ‘Tyranny of Choice’ namely that there is so much music choice now as to be counter productive. 30 million tracks (and counting) is a meaningless quantity of music. It would take three lifetimes to listen to every track once. There is so much choice that there is effectively no choice at all. A host of music discovery services and apps tried to fix the problem a few years ago but most of them failed and went out of business. A new generation of music services such as Songza, Beats Music, MusicQubed and blinkbox Music are now all trying again with heavily curated approaches, delivering music fans the tracks that matter. Even in Spotify, the global home of the engaged music aficionado, curated lean-back experiences are coming to the fore. The access services are stealing some of the clothes of listen services. 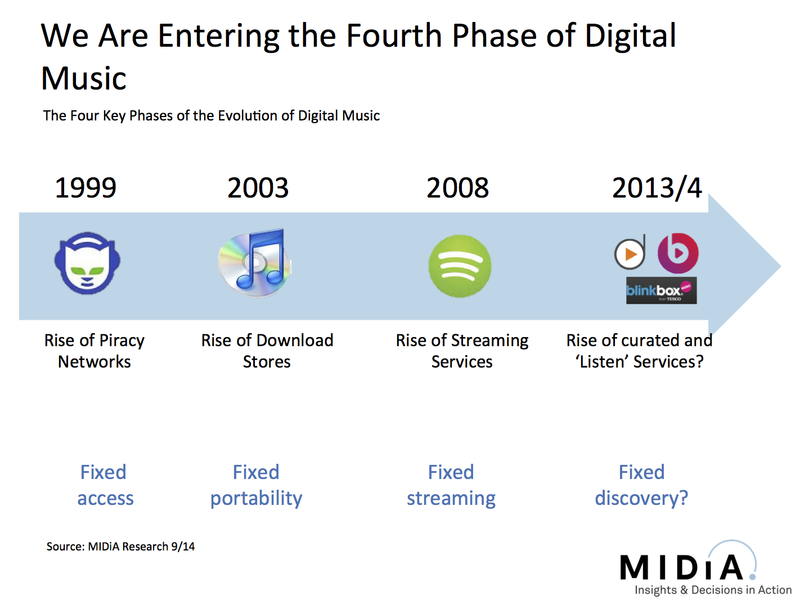 This is no bad thing but it does highlight the importance of this 4th phase of the digital music market, the ‘Curation Era’. Spotify gave consumers access to all the music in the world, now it – and others – is trying to help make sense of it all. This entry was posted in Listen Services, Music Discovery, Streaming and tagged Beats Music, Blinkbox Music, Curation, Mr Probz, Music Discovery, MusicQubed, Songza, Spotify, The Tyranny Of Choice, Tyranny of Choice by Mark Mulligan. Bookmark the permalink. 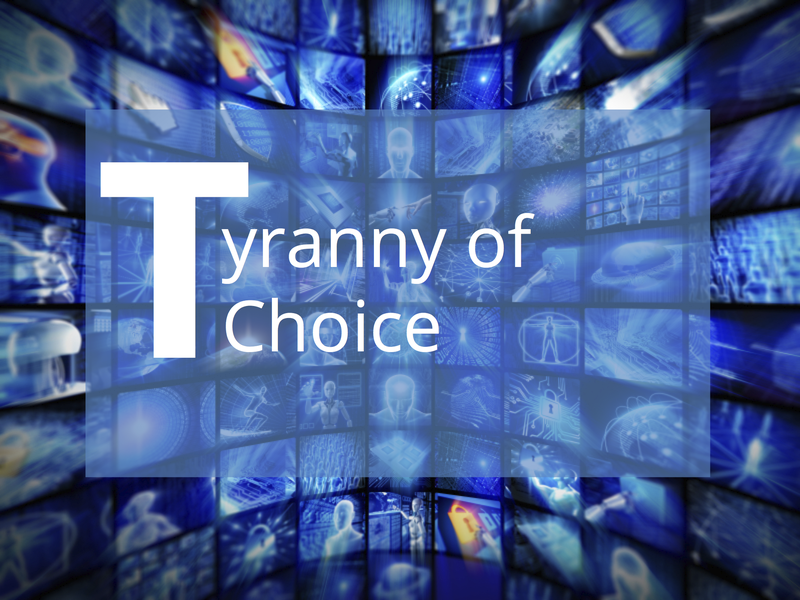 Not sure why you use “my” Tyranny of Choice (aka Paradox of choice) – did you invent this theory? I’m so glad I found this blog. The posts are very relevant to many questions and challenges I’ve met while preparing to record my band’s first EP. But I do have to question the validity of the curation paradigm and how it will fare in the face of the ‘tyranny of choice’. Don’t laypeople create playlists all the time? Will provider-curated services spell the demise of the playlist culture? How do you see all this tying in together? As a music journalist, I’ve been astounded to watch Spotify basically ignore curation thus far. The “home” page is a waste and incredibly, they don’t devote any resources to helping the curious find the cool sounds that are lurking in that big vault. A colossal shame. Centralized curation, collaborative filtering or affinity ranking will never be as effective or valuable for the user as next generation decentralized systems that properly leverage the proximity of the user’s device to the user, x (n) users..
Hi Mark. Big follower of your blog, but prehaps a bunch of credit here should fall upon Barry Schwartz, who in 2004 authored the book “The Paradox of Choice”, which was also translated to a bunch of other languages and the scandinavian version would translate back into english as “The tyranny of freedom of choice”. Your main point and his are alike, you’ve just applied his theory to streamingservices… credit where credit is due. Andreas – I was made aware of that concept after I’d arrived at the Tyranny of Choice so I arrived at the concept entirely independently. Also Schwartz was not the inventor of the idea. The origins of Choice Paralysis analysis can be traced to Aesop’s fable of the Fox and the Cat where the fox fails to escape because the 100’s of routes of escape he boasts of bewilder him into inaction whereas the Cat has just one option and uses it. So I’ll be sticking with ‘the Tyranny Of Choice’ as my concept to describe the specific challenge of digital music catalogue sizes and discovery!